Dmitry Medvedev has inspected a Moscow Metro station, where a pilot security project improving law enforcers’ ability to counter terrorist threats has been implemented. The Russian president and a group of ministers responsible for transport and security in Russia went underground at the Okhotny Ryad station in central Moscow, side-by-side with everyday commuters. Medvedev tested the newly-installed systems for x-ray screening of passengers and luggage and the safe scanning and disarming of suspected explosive devices, which allows a bomb to be disabled without the evacuation of people and closure of the station. He also tried the emergency paging terminal, which allows instant calls to station security. The measures are to be tested before similar equipment is installed at some 50 stations of Moscow Metro system. 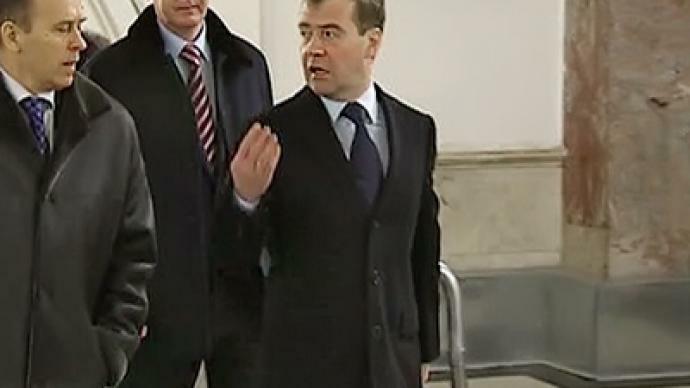 Medvedev ordered the security upgrade in March 2010 after the suicide bombing at two Metro stations.